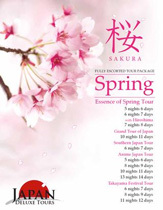 Had a lovely time on the Grand Essence of Spring Japan tour. I found it to be an enjoyable experience, especially all the fine hotels you selected for us to stay in. Spring time in Japan was very enjoyable and the sites we went to were all lovely. I would recommend your company in the future. Very personable, considerate and knowledgeable.